"I'm combining [Valentine's Day] with the idea that President Nelson is a heart doctor. Senior primary will be a little bit harder. (A matching game) I will emphasize that our new Prophet, was a healer of hearts, and we can be too. On the board will be a bunch of half hearts, and they will have to take turns trying to put the correct ones together. We will sing each song as the hearts are being paired up." 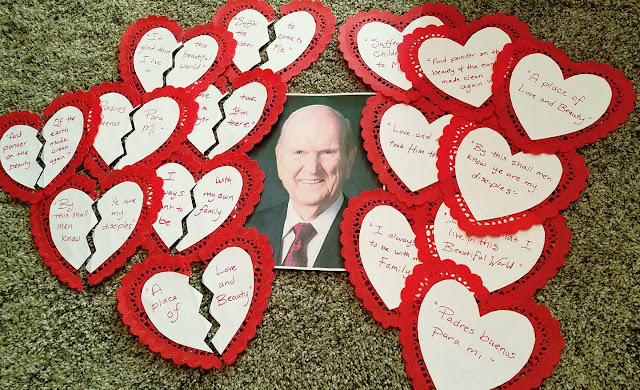 I think I will pass out handbells to Jr. (and possibly Sr.) then as we sing the song, everyone can ring their bell anytime we sing the word "love" (I'm wishing I had bell charts to all of these songs for Sr. - oh well). I'll also post the words to all the songs (see how I do that HERE). If you are unfamiliar with a few of these songs, I'd also recommend playing them on CD/phone and have the kids sing along in addition to posting the words. This is a great way to get the kids to sing lots of unfamiliar songs!! Thanks you for your hard work.